PM Binyamin Netanyahu is set to visit Toulouse Jewish day school where a Muslim terrorist slaughtered a rabbi and three children this year. PM Binyamin Netanyahu is set to visit a Toulouse Jewish day school where a radical Islamist terrorist slaughtered a rabbi and three children this year. Al Qaeda-linked Muslim extremist Mohammed Merah's murderous rampage at the Otzar HaTorah school wounded several others. In the prior week, he had killed three French paratroopers of North African ancestry. Merah's killing spree ended in a hail of bullets two days later when he tried to escape rather than surrender after a 33-hour siege by French special ops police at his apartment a short distance away from the school. His brother has since been charged in connection with suspected terror activities. Merah's father meanwhile has sued the French government for the “murder” of his son. Netanyahu is to be joined on the tour by French President Francois Hollande, who has made it clear that although he disagrees with Israel on its policies in Judea and Samaria, he agrees with the Jewish State on how to handle terrorism. During the meeting between the two leaders Wednesday, Netanyahu expressed his thanks to Hollande for his solidarity with Jews in Toulouse. The prime minister is in France for his first state visit since Hollande's election to the presidency earlier this year. "I am very proud to go... with you to Toulouse to give our common position against anti-Semitism, against extremism against Jews and non-Jews,” Netanyahu said following their meeting at Elysee Palace. The two leaders are expected to meet with Samuel Sandler, father of slain Rabbi Yonatan Sandler, and grandfather of two of the three murdered children, Arye, 5 and Gavriel, 4. Among the issues discussed by Netanyahu and Hollande were the nuclear threat from Iran, the stalled peace talks between Israel and the Palestinian Authority and the rise in anti-Semitism worldwide. At their joint news conference, Hollande told journalists in his own statement that he wanted to see Iran perform "concrete acts" to prove it was not pursuing a nuclear arms drive. He also warned that Paris would back "other sanctions" if Tehran failed to convince on its contested nuclear program. "This is a threat which cannot be accepted by France," Hollande said. "We have voted for many sanctions and are ready to vote others as long as necessary," he said, demanding "proof that Iran has abandoned this drive." 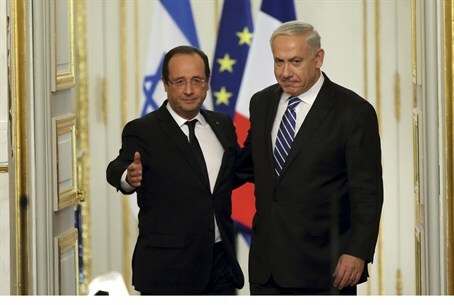 Netanyahu has invited Hollande to personally intervene in arranging direct final status talks in Paris between Israel and the PA.